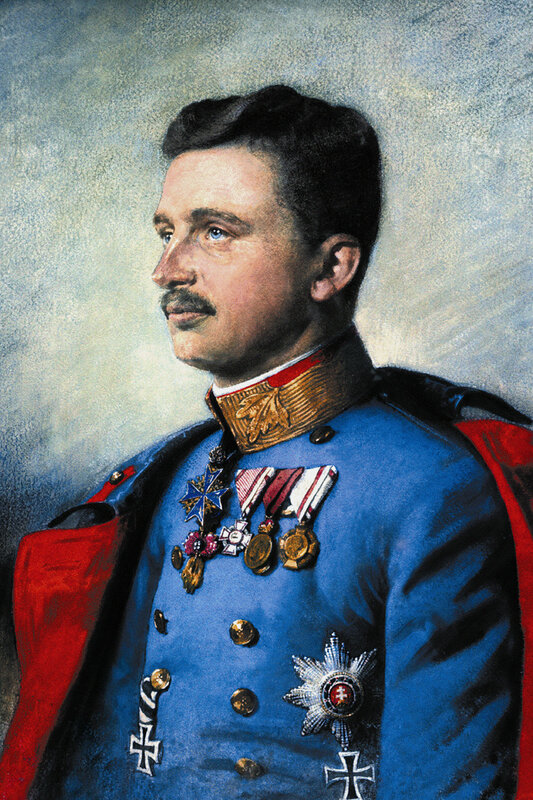 Blessed Karl of Austria, the last ruler of Austria-Hungary before it was dismantled at the end of World War I, is utterly unique as the only leader of a great nation in modern times to be named a blessed or a saint by the Catholic Church. In retrospect we can see him as a great champion on God’s side in the escalating spiritual warfare of the past millennium, and particularly of the past century—the struggle which is epitomized, above all, by the apparitions and requests of Our Lady of Fatima, and the opposition they have encountered. These demonic forces would unleash their fury against Karl during and after his lifetime, succeeding in dismantling one of the last protections of the embattled Church in an increasingly secularized world—just as, since then, they have been at work fending off the consecration of Russia and thus buying more time to advance their same infernal agenda. In 1917 Our Lady of Fatima warned: “Do not offend Our Lord any more, for He is already so much offended.” For us, looking back nearly 100 years, 1917 may look like a relatively innocent time. But at the geopolitical level, we can see that, even by then, the sins of men and nations had already put Catholic civilization on the defensive. England and much of northern Europe had been lost to the Protestant Revolt, and then the Enlightenment and the French Revolution had introduced the concept of a world subject to the Will of Man rather than to the Will of God. A few officially Catholic kingdoms still remained here and there, and the remnant of the Holy Roman Empire, which had been broken up at the time of Napoleon, endured in the Austro-Hungarian Empire, a monarchy where the rights of God still held first place, and whose sovereigns were still crowned by prelates of the Church. France had become a republic, embodying the new liberal, man-centered ideas, and Portugal, where Our Lady appeared, was governed by Freemasons. Our Lady made it clear to the children that “war is a punishment for sin,” and in 1917 a terrible war had already been raging for three years with no end in sight, so devastating and deadly that it was known as the Great War. France, England, Russia, and Italy (known collectively as the Entente) were pitted against Germany, Austria-Hungary, and Turkey (known collectively as the Central Powers). While each of the belligerents had been drawn into the War by some specific provocation or treaty obligation, and each had its own specific goals, it has become clear that destruction of the monarchies and destruction of the influence of the Church over the affairs of nations, was an unspoken, underlying agenda which kept the war going in spite of all reasonable efforts to end it. Leading Austria-Hungary in 1917 was the young, 29-year-old heir to the Habsburg dynasty, Emperor Karl, who had inherited the Austrian throne the previous November 21 at the death of the long-reigning Franz Josef, and had then been crowned King of Hungary in a magnificent religious ceremony in Budapest on December 30. He had opposed his country’s entry into the war from the very beginning, and had already tried to negotiate peace as an emissary of Emperor Franz Josef. His tenacious search for peace would so mark his reign that he would be known as the Friedenskaiser or Peace Emperor. And peace is the key word in the first connection linking Emperor Karl of the House of Austria, who was beatified by Pope John Paul II on October 3, 2004, to the agenda that the Queen of Peace, God’s Holy Mother, offered to the world at Fatima. In this talk I will discuss three distinct connections between Our Lady of Fatima and Blessed Karl. The first is historical and geopolitical. Both made news in the same year. Both had the same goal: peace. Both had the same basic concern: the salvation of souls. Both gave primacy of place to the Holy Father. Both warned about the great looming danger about to come out of Russia, a threat to the Church and the world which no one else yet appreciated. The second connection is the message of Fatima itself, which is played out so beautifully in the life and virtue of Blessed Karl that he provides a unique model for living out what Our Lady requests of each of us, as well as a unique intercessor for our petitions that the Church would soon carry out Our Lady’s requests at the geopolitical level. The third connection is the official linking of the two Causes, which have run parallel to each other for nearly a century: the effort to obtain the fulfillment of the requests of Our Lady of Fatima and the Cause for the beatification and canonization of Emperor Karl. Linking all three of these connections between Our Lady of Fatima and Blessed Karl has been the furious reaction against both of their agendas by the forces of Hell. At the same moment in time that the Mother of God was appearing at Fatima and sharing her peace plan for the world, one world leader was also trying with all his might to stop the war. This was Karl, Emperor of Austria, King of Hungary, who embodied within himself the last vestiges of the Holy Roman Empire, which had once ruled over a united Christendom. His ancestors of the House of Habsburg had been selected as Emperor almost continuously since the electors chose Rudolf of Habsburg in 1273. When the Archduke Karl was born in 1887, Emperor Franz Josef had already been reigning nearly forty years. It was never imagined that Karl would inherit the throne; there were too many ahead of him in the line of succession. As a member of the ruling house, Karl became a military officer, which meant that, when war was declared in 1914, he was plunged into the thick of the fighting. Austria had moved to punish Serbia for the assassination of Archduke Franz Ferdinand with what was at first intended as a limited military mobilization. But all the major nations of Europe jumped into the fray, ostensibly in order to be faithful to a network of alliances, but also because other nations were waiting for an opportunity to pursue military objectives of their own. Suddenly Austria-Hungary was surrounded by enemies, who considered the empire technically responsible for starting the war, even though it had been provoked by the premeditated murder of its heir to the throne. The Archduke Karl had no part in getting Austria-Hungary into the war. He was never in favor of it, fearing that it would be disastrous for his countries whether they won or lost. Nevertheless he was known as a brilliant military commander. Serving at the front in Italy, Transylvania, and Galicia, he won nearly every battle he fought. In the trenches and over all types of terrain he was fearless for his own safety, but very concerned about the well-being of the men who served under him. Using wisdom and strategy, he would not sacrifice the lives of his soldiers by sending them needlessly into hopeless situations. He cared for the wounded, and wept over the charred bodies of the fallen. At the height of the hostilities, Franz Josef died, and the heavy burden fell automatically upon Karl—responsibility for the multi-nation empire and all its peoples, responsibility for the conduct of the war and the lives of all his soldiers. The new ruler right away drew up a proposal for a peace conference, which was signed by his allies and delivered to the Entente. At the time, Austria-Hungary and its allies held the military and territorial advantage. But rather than pressing ahead to destroy the enemy nations, he was willing to negotiate peace, a peace without victory. However, the response of the Entente was abusive. At the same time, he warned his German allies that their aggressive submarine warfare was sure to bring the United States into the war on the side of their enemies. Facing this additional adversary, with its inexhaustible reserves of manpower and resources, would mean certain defeat and ruin for the Central Powers. Emperor Karl was the only head of state to respond to the peace proposal of Pope Benedict XV, even as he continued his own outreaches. He moved to make contact with Woodrow Wilson while the United States was not yet in the war, refusing to agree to Germany’s demand that he should break diplomatic relations with the United States. The emperor made it clear that he sought peace not for military reasons, but because of the responsibility he felt toward the peoples of his empire and for all the belligerents and all the people of Europe. The most promising of his peace initiatives was his attempt to make contact with the enemy through his brother-in-law, Prince Sixtus of Bourbon-Parma. He wrote a letter to Sixtus, which could be shown to the Entente leaders, in which he offered everything that they had demanded up until that time. At first the reaction was favorable. France was receptive; British Prime Minister Lloyd George exclaimed, “This is Peace!” Karl had even confided to the German emperor, without giving details, that he had great hopes for this peace feeler. Peace seemed at hand. But then the French government fell, and was replaced by one totally antagonistic. The British, also, had signed a secret treaty with Italy the year before, promising that country huge portions of Austrian territory, and now felt they could not make peace because of these secret obligations to Italy. So this effort, like all the others, shattered on the rock of secret treaties, and the insistence of all other belligerents on total victory, no matter what the cost in lives or in the suffering of their peoples. By May of 1917, Emperor Karl’s peace proposals had been definitively rejected by all parties. Pope Benedict, who had served in the Vatican’s diplomatic service before his election to the papacy, could see that all human diplomatic means, including his own, had failed. A week later, the Virgin Mother began her apparitions at Fatima, promising the end of the war and offering her own peace plan. The Queen of Peace must have taken pity on the poor Peace Emperor, so frustrated in all his efforts to negotiate an end to the senseless carnage. A silhouette by a contemporary Austrian artist, Josefine Allmayer, shows the Queen of Peace comforting the Emperor of Peace as he stands in profound sorrow over the graves of his faithful heroes. Besides the goal of peace, Our Lady of Fatima and Emperor Karl shared a deeper concern: the salvation of souls. By making the vision of Hell the first part of Her secret message, Mary emphasized that there is no greater evil than sin, and the danger of spending all eternity in the fires of Hell. This spiritual danger was also paramount in Blessed Karl’s anguish over the millions dying in the war. It informed his intense concern over the temptations assailing his exhausted and hungry people, and led him to try his utmost to improve the moral environment of his soldiers at the front, giving them every possible opportunity to hear Mass and receive the Sacraments. The Mother of God and Blessed Karl also shared another concern, looking to the future. The beleaguered emperor could not have known that Our Lady of Fatima, in her secret, had revealed that Russia would be the instrument used by God to chastise the whole world if men refused to turn away from sin or to take advantage of the remedies she offered. Alone among the world leaders of the time, Emperor Karl saw the threat that Russia would become to all of Europe. He urgently warned his allies and adversaries to make peace, because the real enemy of all of them lay in the East. When the German military leaders, in their short-sightedness, decided to send Lenin in a sealed train back into Russia from Switzerland, so that he could foment the Revolution and thereby knock Russia, one of their enemies, out of the war, Karl vehemently refused to let the train pass through Austria, first, because it would be such an injustice to the Russian people, and second, because he knew that communism, once established in Russia, would quickly spread to other countries. In her final apparition, Our Lady told the children, “The War is going to end, and the soldiers will soon return to their homes.” But in her July secret, she had also warned that, unless men stop offending God, another worse war would break out, and unless her requests were obeyed, Russia would spread its errors throughout the world. A few days after her final appearance and the great Miracle of the Sun, the Communists took over Russia. A common feature in the agendas of both Our Lady of Fatima and Blessed Karl is the primacy of place given to the Holy Father. The Roman Pontiff has a huge part to play in Our Lady’s peace plan, as he does also in the world view of Emperor Karl. As ruler of a Catholic confessional state, the Austro-Hungarian monarch saw his duties as, first of all, upholding the rights of God, and second, giving himself completely in service to the temporal and spiritual good of his people. He publicly honored the Pope as Vicar of Christ, deferred to him in matters of faith and morals, and was prepared to come to his defense with all the power at his command. This cooperation between the Catholic empire and the Catholic Church was the main reason the enemies of Christ used every means possible to bring about its downfall. They tried to stir up division between the empire’s component ethnic groups, tried to foment revolution from within, and tried to keep the war going long enough for their tactics to succeed. Meanwhile, they launched a furious propaganda campaign against the emperor himself, hoping to discredit him in the eyes of his people. Within a span of two years, through an incessant barrage of lies and innuendo, they managed to change the image of a monarch genuinely loved by most of his people to one whose abilities, honor, integrity and patriotism evoked doubt and derision. The obstinacy of all the other belligerents in holding out for total victory provided the necessary time to those working to destabilize the empire from within. Karl’s people were cold, hungry, demoralized, and desperate. After the Allies committed themselves to the aspirations of expatriates hoping to form new national states out of pieces of Austria-Hungary, revolution at home finally combined with exhaustion on the battlefield to bring about the disaster Karl had tried so hard to prevent. The War was lost and the empire broken up. The Habsburg monarchy was overthrown, and its young ruler Karl forced from power. In spite of all the love he had shown for his people—creating innovative and imaginative social programs, visiting with them personally in their villages and towns to listen compassionately to their concerns, and giving sacrificially out of his own means to relieve their mounting hardships, as well as all the good he intended to do for them once peace was restored—this Prince of Peace, this loving father of his people was forced out of his country into exile, all his possessions large and small were stolen from him, and he and his family were left destitute. Blessed Karl never blamed his people for rejecting him at that traumatic time of defeat and privation. He had been deeply moved that they had borne their sufferings so patiently for so long. The former emperor and his family took refuge in Switzerland. Although deprived of his power, Blessed Karl still felt responsible for the peoples God had placed under his protection. He had managed to carry with him a few of the family’s private jewels, intending to sell them one by one to support his wife and children during their exile, but he couldn’t resist drawing upon this small reserve to help his former subjects who came to him in desperation. He even sent aid to the poor people of Russia, now suffering under the yoke of communism. A constant stream of visitors from home, from all strata of society, came to consult with him. In between, he spent his days working to prevent Austria from being absorbed into Germany, and developing his plans for a new, mutually beneficial confederation of the nations of the Danube Basin, which he hoped would sooner or later reunite under his scepter. Instability gripped the entire region that had been his Empire. Since his absence, Hungary had suffered through the communist regime of Bela Kun, the White Terror, and an invasion by Rumania. More and more frequently and urgently, visitors from Hungary begged him to try to reclaim his kingdom. What was not known at the time was that Pope Benedict XV was one of the strongest voices urging his return. Benedict considered the Catholic empire to be the essential bulwark against the encroachment of atheistic communism into the rest of Europe. The urgent appeals of the Pope carried great weight with the Catholic monarch, and reinforced the heavy burden of responsibility laid on him by his coronation oath. King Karl came back to Hungary twice in 1921, to the acclaim of his people and with the promise of support from France. But he was betrayed, and the efforts failed, causing him to be denounced by the victorious allies as a disturber of the peace. Never once did he hint that the Holy Father had anything to do with his decision to return to Hungary. Refusing to let the Holy See be tarnished with the failure, he bore the responsibility and the punishment alone. With so much controversy and attention being focused on what the Holy Father must do to fulfill Our Lady’s requests, one might sometimes forget that all of us have an important role to play in spiritually supporting him through our prayers and sacrifices. Of everyone Our Lady asks: the daily Rosary, the five First Saturdays, prayer for sinners, reparation to God through prayer and sacrifices, and fidelity to the duties of one’s state in life. In trying to fulfill these heavenly requests ever more perfectly, we could have no better model than Blessed Karl. In one respect, his state in life was the one shared by most people: he was a devoted husband and loving father. “In this atmosphere of the most warm love, of unbreakable trust, of honesty without reserve, of intimate security and reciprocal respect, our marriage became extraordinarily happy. The Servant of God was the most faithful, loving, good, patient, gentle, and considerate husband. “We shared everything: joy and sorrow, fear and worry, hope and happiness. The hard blows wounded us together, we both suffered them. The Servant of God considered his family as the Noah’s Ark that God in His infinite goodness had given him. In this he took refuge, reinvigorated himself, drew new strength for the difficult road of his life. Unlike the rest of us, Karl was also a Head of State, ruling one of the most important nations on Earth. Yet ironically, it is in this role that he can perhaps be of most help to us. Let me explain. Most of us receive our most thorough moral training when we are children. We are shown how to be a good child, a good student. “Honor thy father and thy mother” is probably the most central commandment in our early years, and its extension to other authority figures is well stressed. To honor and obey, to be devout, humble, docile, gentle, patient, kind, forgiving, and eager to please others, especially superiors, is to achieve the height of virtue in a child’s state in life. But what happens when children grow up? What if a devout young man or woman becomes the person other people have to honor and obey? The authority figure—whether priest, religious, or layperson—responsible for the behavior of others, who must command, reward, and punish? The administrator who must make heart-rending decisions, who must discern what virtue requires, and then act with courage, willing to accept blame for the outcome? There is no program to train us in these adult virtues, which we must acquire without losing the first set. This deficiency in training might explain why so many parents defer to the wishes of their children, for fear of seeming too harsh, in situations when it would be more virtuous to assert their authority. This is one reason why there is so much shoddy workmanship, so much waste in government. While few of us will head a nation, most of us do have responsibility for guiding the actions of others, whether it’s our children, our students, or our subordinates at work. Blessed Karl, in his exalted position, gives us a uniquely clear picture of what these strong, adult virtues look like in practice. Empress Zita testified that her husband carefully distinguished between the dignity due to his office and the humility with which he would endure personal offenses. During the tumultuous days when his empire was crumbling, Karl was betrayed on every side, by some of his closest associates, and by many who had reveled in court life and all the honors which had come to them only through his goodness. A sympathetic priest in Switzerland, Fr. Maurus Carnot, tried to comfort him for all he had suffered. “I have already forgiven everyone for everything,” he said. Someone wondered, supposing he returned to power, how he would deal with a traitor, who might seek to take advantage of this forgiveness. Karl explained, “As a Christian, of course I have forgiven him from my heart. But as King, I would have to punish him.” Yet Karl, the just ruler, would always try to mitigate harsh sentences and to show mercy whenever he could. As a father, Blessed Karl took the direction of his children very seriously. Visitors to the family would often see him carry a small child into the chapel, tenderly fold the child’s tiny hands, and help him make the Sign of the Cross. During certain periods of their exile, he took over the education of his children personally, and the older children reported that they never learned more than when he was their teacher. When to heal his heart problems, doctors ordered him to stay in bed, his children would gather around his bed, and Karl would tell them all about every bird, plant, and animal that they could see from the window. He often took long walks with his children, teaching them about everything under the sun. He would announce each day’s topic the night before, so that the children could prepare their ideas and questions. Whenever a child would inadvertently hurt himself, or be offended by something, he would remind him gently, “What is this compared to the suffering of Christ?” He would never allow his children to condemn anyone, even those who had brought the whole family to such ruin, explaining that his enemies did not enjoy the great blessing of the Catholic faith. He instilled in his children a deep love for the homeland, and all of its peoples. No one ever observed any bitterness in the emperor or heard him utter a single word against anyone, even his worst betrayers or persecutors. Instead, he made it his mission in exile to pray for his enemies and make reparation for their offenses against him, which were ultimately offenses against God. While still in power, despite his heavy responsibilities, Blessed Karl had lived in a state of interior prayer. Even in the worst of times, he exuded a deep serenity, leading one witness to testify: “His face and his whole being seemed to say, ‘Thy Will be done.’” He prayed before every meeting, every decision. His day began with Holy Mass, and always included the Rosary, even when Zita had to interrupt him 15 minutes before midnight during an important meeting in order for him to say it. Tenderly devoted to Our Lady from earliest childhood, he had entrusted his marriage to her protection. He had completely worn out his rosary beads praying so many rosaries out on the front. During his exile, Blessed Karl would spend hours in front of the Blessed Sacrament. “I’m in the presence of my King!” he told his aide, Karl Werkmann, who frequently used to see him enter the chapel alone and remain standing, for an interminable length of time, in rapt contemplation before a single station of the Way of the Cross. On his secret journey from Switzerland on his first restoration attempt, King Karl prayed alone for four hours during the night in St. Peter’s Church in Vienna before proceeding on into Hungary. His life was also a constant sacrifice. All the enormous losses that he suffered he offered up “for his people.” Like the Fatima children, he also constantly looked for little mortifications that he might offer up. Shortly before the second trip to Hungary, Karl said to Zita, “I have the feeling that the Lord is asking of us a great sacrifice.” When the restoration attempt failed, and they found themselves in Madeira, the nature of the sacrifice that God was seeking took on more and more clarity. He began to realize that God was inviting him to sacrifice his life for the salvation of his people. This was a terrible request to ask of someone who loved his wife as much as Karl did. Not just having to leave her but realizing how much she would be hurt. And then there were the little children—seven of them, and one still on the way. And he would have to leave them in utter destitution! And not only his own family, but all the people of his lands, whom he loved as a father. But after weeks of intense inner struggle, he confided to Zita that he was now firmly convinced that God was indeed asking this sacrifice. “And I will do it!” he said finally. That God accepted his sacrifice was shown a few months later when the emperor caught the flu, which deteriorated into pneumonia. Gradually he reached a state of unspeakable agony, not only from the worsening symptoms, but also from all the excruciating treatments, administered one on top of the other, in a desperate attempt to save his life. Through weeks of mounting physical torture, no one ever heard from him a single complaint. All the virtues which Blessed Karl had developed to a heroic degree during his entire life shone with full brilliance during his last illness: kindness, patience, concern for others, courage, a generous willingness to sacrifice and suffer for others, all united in the most lovable and endearing sweetness. Karl made his illness a time of constant prayer. He prayed for his family, and for the peoples of his empire, whom he loved as a father. “A father’s prayer pierces the heavens,” he explained to Zita. He prayed in expiation for the sins of his people, and for their salvation. He prayed especially for his enemies. Never once did he pray for an alleviation of his sufferings, or even for a little bit of relief. He continued to offer himself in as perfect a sacrifice as he could possibly make it. Though it seemed unlikely at the time that little Karl would ever become emperor, a small group of people in the area did take her premonition to heart and begin to pray for him. Twenty years later, their mission took on urgency as events played out just as predicted, and Karl’s life became ever more tragic, ending in his early and painful death. By this time the prayer group was much larger, claiming members throughout the empire. They decided not to disband when the emperor died, but rather to continue the mission to which he had devoted his sufferings in exile and his sacrificial death: praying and making reparation for his people. This group was given official status by the Church in June 1925. Members pledged themselves to make reparation for all sins and offenses committed against God and against legitimate earthly authority, and to pray for peace among the peoples and nations of the World. 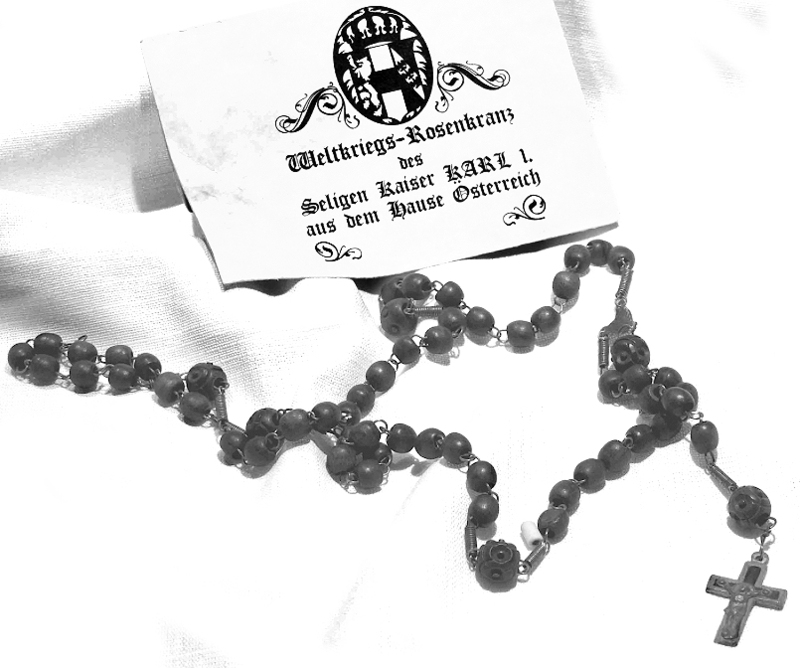 They chose as their motto “Oratio et Satisfactio” (prayer and expiation), and formalized their name as the Emperor Karl Prayer League for Peace Among Nations. Meanwhile, on Easter Sunday, exactly one year after the emperor’s death, Wilhelm Miklas, who had worked under him in the government and later became President of Austria, had written to Cardinal Piffl, the Archbishop of Vienna, requesting that he officially begin the process toward the beatification and canonization of Emperor Karl. It was only natural that the Emperor Karl Prayer League, whose focus was already on Karl, was chosen as the agent to promote his Cause, and to gather testimony at the local level. When Germany overran Austria in 1938, one of the first people to be arrested, imprisoned, and to die at Dachau was the League’s charismatic leader in Vienna, Hans Karl Zessner-Spitzenberg. Terrified, and frantic to shield everyone else identified with the group from the Nazis, a secretary burned all the records that had been collected over 20 years. After World War II, they basically had to start all over again. During a gathering of the reconstituted League on November 13, 1948, the Cause of the Servant of God Karl was placed under the protection of Our Lady of Fatima. To Karl of Austria was entrusted the peace of the world. 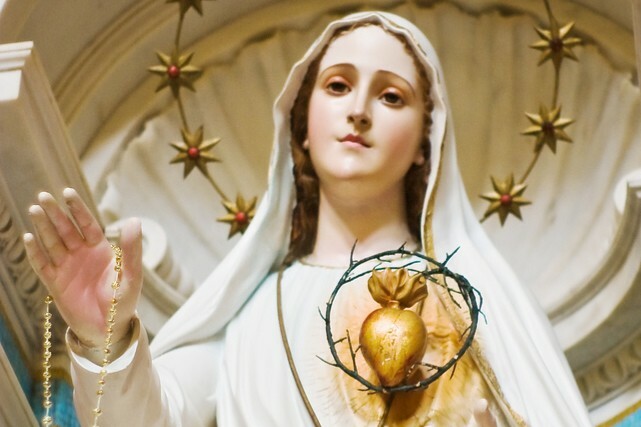 The League members looked to Mary for the answer to their prayer for Karl’s beatification, and to Karl’s intercession for the fulfillment of Mary’s requests at Fatima. First, Karl and Our Lady of Fatima shared the same goals—both offered peace plans in 1917, both were concerned not only about the horrendous loss of life but about the loss of souls, both saw the tragedy of a world turning from God, and both foresaw the evils that would spread through the world from Russia. They both would find vindication in the world peace and the triumph of the Immaculate Heart promised after the conversion of Russia. Second, the League found that its motto, “Oratio et Satisfactio”—Prayer and Expiation—described both the essence of Fatima spirituality and Karl’s perfect fulfillment of it. In 1949, the Cause for Emperor Karl moved to Rome. As part of the beatification process, his tomb in Madeira was opened in 1972, fifty years after his death, and his body was found incorrupt. Besides the usual rigor of the canonical investigative process in those days, the Vatican recruited a special historical commission to help them scrutinize the life of this public figure, whose decisions had affected the destinies of men and nations. Finally, on October 3, 2004, Emperor Karl was declared Blessed. Members of the Emperor Karl Prayer League have to believe that this glorious day came about through the intercession of Our Lady of Fatima. Now we encourage all devotees of Our Lady of Fatima to call upon Blessed Karl as a most powerful patron and intercessor. Who better to pray with us to hasten the day of Our Lady’s triumph over the forces of Hell that continue to assail them both? Who better to intercede for the consecration of Russia, the release of her Third Secret, and the long-awaited World Peace promised by the Queen of Peace, than the Peace Emperor, Blessed Karl.